Legal thrillers! 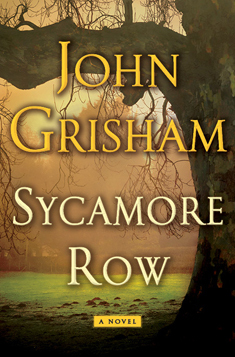 I’m on a little roll here, first with Michael Connelly’s The Gods of Guilt (Mickey Haller) and now John Grisham’s Sycamore Row (Jake Brigance). It’s an embarrassment of riches. First, let’s all agree that John Grisham is the grand poobah of the courtroom drama. There may have been legal thrillers before Grisham, but he’s made the genre what it is today with his series of books featuring intricate, compelling plots and human characters. Click here to see his works, many of which have been made into highly successful movies. We can also agree that John Grisham is a solid writer. Unlike some famous authors, his books continue to be very well-crafted and well-edited. So you know Sycamore Row’s going to be worth reading. And it is. It’s been a lot of years since Jake Brigance first came to our attention in A Time to Kill, but in Clanton, MS, it’s still 1988. Following the triumph of the Carl Lee Hailey case, Jake’s struggling to pay the bills and living with his wife and daughter in a rental house (his own home was firebombed by white supremacists during the Hailey trial). The case led to one good thing, though – out of all the lawyers in Ford County, rich Seth Hubbard picked Jake as the lawyer to handle the distribution of his extensive estate. Jake learns of this only after Seth hangs himself from a tree outside of town. His hand-written will leaves 90% of his $20 million estate to his black housekeeper/caregiver, 5% to his brother, and 5% to charity, disinheriting his children. Seth’s chosen Jake because of his defense of Carl Lee Hailey. So, while it’s not a murder trial, there’s definitely a courtroom battle looming. Jake’s challenge is to defend the will and speak for Seth. That’s pretty hard – judge and jury alike will be quick to assume some undue influence given the balance of racial distrust and deference to blood ties. Any man who leaves his fortune to his housekeeper and cuts off his blood kin must be either crazy or sleeping with the woman in question, or both. So Jake has to not only debunk the naysayers, but deliver a compelling motive. No surprise, he pulls it off. I think the typical reader will have strong suspicions about what’s coming pretty early in the book, but Grisham is skillful in revealing it, and the final revelation will generate a shiver or two. And, ever realistic, Grisham addresses the likely outcome of any successful trial of this type: the threat of endless appeals necessitating a settlement agreement. No clucking from the attorneys who read Sycamore Row. Yes, McConaughey plays both Mickey Haller and Jake Brigance in the films The Lincoln Lawyer (2011) and A Time to Kill (1996). I had him in my head while reading both books, which is no hardship. I’d buy a ticket to any sequels he makes in either series! When it comes to the novels, I’d give Grisham the edge for writing style, Connelly for plotting. Both books are on the “must read” list. This entry was posted in Commentary, Review and tagged A Time to Kill, John Grisham, legal thriller, Review, Sycamore Row, The Lincoln Lawyer. Bookmark the permalink.